Shannon McNevan, director of the wildly popular Boots and Hearts Festival, is just one of seven dynamic individuals who will share their stories and reveal how they beat the odds to achieve success during the annual Peterborough Speakers Series event at Market Hall, April 10, 2013. Presented by the Greater Peterborough Health Services Foundation, “UNSTOPPABLE” also features Olympic Silver Medalist Ashley Brzozowicz, Peterborough Lakers president Ted Higgins, mystery writer John Moss, comedic actor of television and theater Derek McGrath, Trent University professor and expert in economics Dr. Tom Phillips, and dynamic motivational speaking duo Barbara and Bill Johnston. 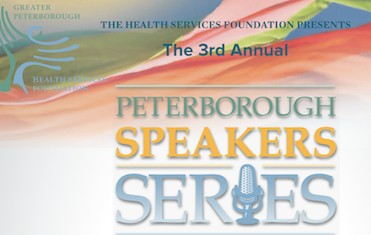 "The Peterborough Speakers Series shines a spotlight on some of our community's most dynamic and innovative people," says Health Services Foundation executive director Hannah Routly. "We’re excited to present their remarkable contributions of personal and professional success." Doors open at 6:00 p.m., and speakers begin at 7:00 p.m. An intimate cocktail reception follows, offering attendees an opportunity to connect and chat with the speakers in a relaxed and casual setting. Tickets can be purchased online or by calling 705-740-8074.